New variations of the same basic process are starting to emerge; one in particular is know as Natural Metallic Color Micas. Colored Mica systems are installed much the same way, with the same prep and base coat. The difference is that instead of using vinyl flakes to broadcast they are replaced with natural crystalline metallic flakes. Through a technical manufacturing process, the distinctive hexagonal atom arrangement of the mica minerals is separated into sheet-like pieces and broken down into standardized flake sizes. These unique flakes provide a natural metallic luster that cannot be achieved with other engineered materials. 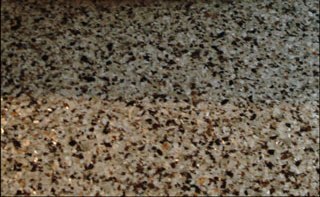 By blending various colors of these metallic flakes with various colors of epoxy a multitude of finishes can be achieved. These finishes take on a random and varied pattern with the common element of metallic shine throughout. 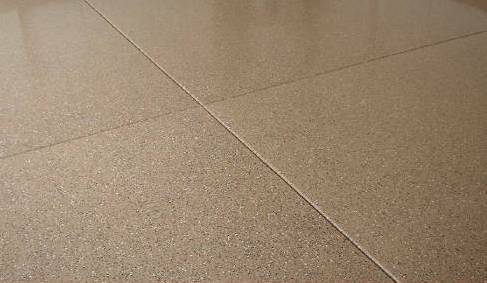 Natural Colored Mica flooring systems are great for those homeowners who are looking for something that is totally unique in the garage or even interior areas like the basement. Be prepared to spend a little more than a traditional decorative flake system. However, the end result will be worth it.